VANKLEEK HILL, ON – Beau’s All Natural Brewing has announced it will be releasing a fourth annual Best of Beau’s mixed pack for the winter holiday season, and fans of the brewery are once again being called upon to pick the brews that will be featured in the package. From now until June 7th, Beau’s drinkers can vote online or in person at the brewery store to choose their favourite from the many beers Beau’s has brewed since it was founded almost nine years ago. Several collaborative and aged beers that can’t be recreated are not on the list, nor are year-round brands such as Lug Tread Lagered Ale and The Tom Green Beer. But otherwise, voters can select from almost every seasonal, one-off and limited edition beer that Beau’s has created over the years. And for a change this year, voting is now structured in weekly head-to-head rounds, with the beers split into four brackets – Hopheads, Heavy Hitters, Traditionals, and Wild Cards – and the final winner of each bracket to be included in the package. 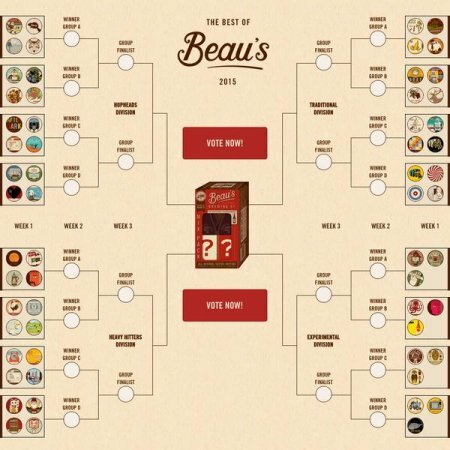 The winning beers will be announced June 10th, and the Best of Beau’s mixed 4-pack featuring 600 ml bottles of the winners will be available at select LCBO locations and the Beau’s retail store this November, with a retail price of $26.